King Min Ra Zar Gyi took the throne of Mraukoo in 1593 AD. Queen Khin Hnaung of king Min Ra Zar Gyi gave birth to a daughter. The messenger who wanted to tell of the birth of the daughter and the fisherman who wanted to tell of finding the Buddha image in the water when he pulled his fishing net, met at the royal court. But firstly, the fisherman told the king that he found the Buddha image in the water. Therefore, King Min Ra Zar Gyi held a great ceremony and lost of people pulled the rope tied to the Buddha image in the water. And then, when the king asked the ministers why the Buddha image didn’t appear from the water, minister Lat Way Myan, the governor of Mayou, narrated the king about king Vesali Maha Tine San Dra and his chief queen Thu Pa Bar and he told the king that the Buddha image would appear from the water only if his baby daughter conveyed it as a laywoman devotee because she was a reincarnation of queen Thu Pa Bar. The king took his daughter in the emerald cradle to Shwezeewa harbour. And, one end of the ornamental cord was wrapped around the daughter’s right hand and the other end, around the Buddha throne. And then, when the Buddha image was pulled swinging the cradle by singing the cradle song, the Buddha image gradually come out of water. Filling the foreshore with the soil, the Buddha image was placed in the cave tunnel in AD 1603. 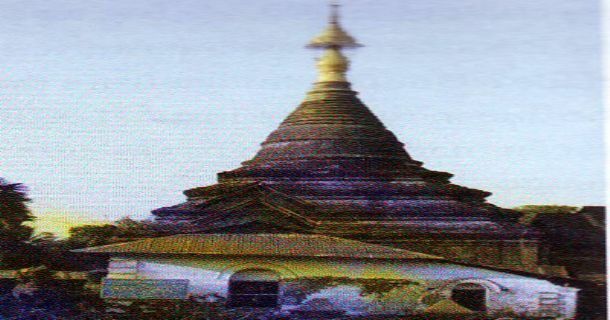 Rakhine people call it Parabaw because it is a Buddha image appeared from the water. The Buddha image had to dwell in the water for 1276 years. The pagoda is surrounded by the great wall. The present pagoda was built by Myanmar governor Maung San Pyaw by building terraces over the cave tunnel. The pagoda has four cardinal points at the base. Each cardinal point has a lion statue. There are entrances in the east, the south and the north. The prayer halls are in the east and the north of the pagoda. The southern prayer hall was donated by U Kywin Phyu. The pagoda is maintained by the board of trustee of the pagoda.